I'll say this for director David Wnendt; he knows how to make an impression. He both repulsed and charmed Sundance audiences in 2014 with his gross-out rom-com Wetlands which introduced me and many others to the exquisite talents of actress Carla Juri. 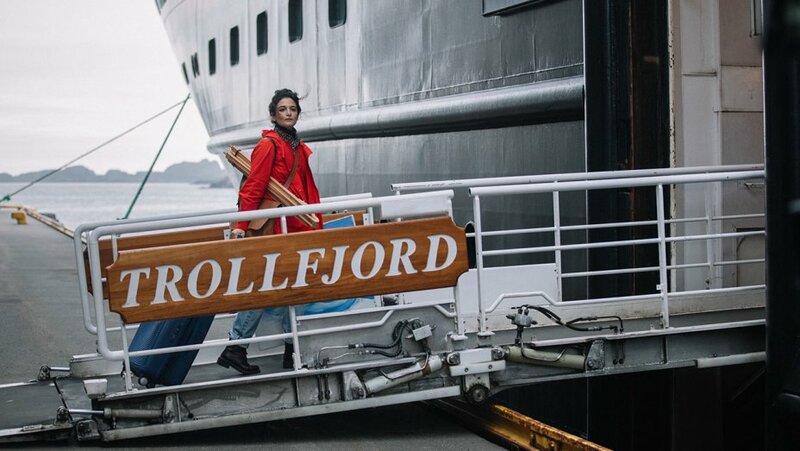 Wnendt's starry followup, The Sunlit Night, offers a similarly strange romantic entanglement for another Park City favorite, Jenny Slate, but the talented actress can barely make heads or tails of an underwritten character and a love story as dim as the Norwegian sun is beaming. As Frances, a failed New York painter dealing with a sudden breakup, her sister's impending nuptials, and her parents' separation. She needs to get away, and having turned down a prestigious art internship due to her ex-beau's influence, Frances goes scrambling back looking for anything that's left. Her only option is an internship in Norway with a gruff painter trying to finish a public presentation of a...yellow barn. Frances thinks she's going somewhere glamorous, but instead she ends up in a ramshackle town near the top of the world, populated by oddballs in Viking costumes for the most part. The Vikings, who live in a community run by a dude from Cincinnati (Zach Galifianakis), are just part of the reason why Frances is distracted from her long days at work. Another is the presence of poor, melancholy Yasha (Alex Sharp), a Russian who has arrived from New York to give his deceased father the Viking funeral he always wanted. Perhaps something got lost in the translation of Rebecca Dinerstein's novel, but since the author doubles as screenwriter that's unlikely. Perhaps the connection between Frances and Yasha, which is presented as so profound it needs hardly any words, was always meant to be so threadbare. Within moments of spotting him on the road she's ingratiated herself into his life, taking part in his father's funeral and running off with him to the detriment of her work. It's simply not enough to say their mutual fish-out-of-water status is what drove them together; the kind of bond they have still needs some emotional foundation. Slate and Sharp's chemistry is nonexistent as a result, while individually they make the most of two bland characters. The same can't be said for Galifianakis' misplaced dufus role as the Viking "chief", and the less said the better about Gillian Anderson as Yasha's estranged mother, in a curious turn that is part Black Widow/part Rocky & Bullwinkle. Even after what seems like a half-dozen endings the film keeps chugging along as if the filmmakers are hoping to find the inspiration that has been missing. It's easy to see why Frances would fall in love with the place, despite living in a cramped trailer tagged "Welcome to Hell" by the previous occupant. But our fascination with the mountainous views and sun-kissed landscapes only highlights what a missed opportunity The Sunlit Night is, failing to inspire even a little bit of passion. However, it does fuel a desire to plan a Norwegian vacation. Probably not the impression Wnendt hoped to make, but it's not a total loss.